Yesterday I was talking about the significance of names, and today I like to share more. In the course of selling life insurance, I had to guess the age of my prospects. Not many are willing to tell their age, especially the ladies. Is easy if you could see them face to face, because the face's line of a person could determine their age. Otherwise just on phone calls conversation alone might be difficult. You have to listen carefully the tune and loudness to guess the caller's age. For me is still easy because I had 45 years of cold calling on phone to make my sales. Very seldom a lady could mislead her age with me. I might not have seen her in person but the voice on the telephone alone could reveal her youthfulness to me. Don't believe me? Try calling me then. Next! 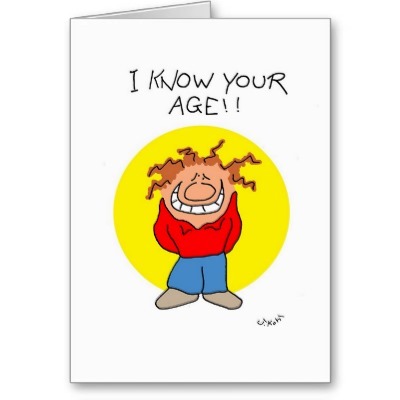 If you hadn't seen and heard a prospect's voice before, could you still guess the person's age??? Yes I do! Do you know the name of a person can tell a bit of his or her age? Example Robert, Richard, Annie or Jenny are old names. They should be at least 50 years and above. Alvin, Baldwin, Priscilla or Stephanie are slightly younger. Perhaps they are in their forties. Recently I had a reader from The States who wrote personally to me. Though he didn't reveal his age, in one of my emails to him I wrote... "To me here, Gary is an old traditional name and I believe you are not to far away from my age. However with your branding of Bandit, it indicates to me you are daring and playful as well. I am a young old man and I think you are too. And that's the reason why The Almighty Universe brought us together". He replied... "You are very accurate with your guesses. ;^) Gary is an old traditional name here too, which means soldier or warrior. I am not too far away from your age at all, in fact we are the same age, we are both 65. Having admitted that, I have to say I don't feel that old. I still feel like I'm in my 30s, the way you do, so it is a bit of a dilemma for me at times". I hope this little sharing could be useful to all my readers.